First off, I should inform you that this pork souvlaki recipe is not authentically Greek. It has soy sauce in it, but once the meat is cooked, you can’t tell that it was flavoured with soy sauce. 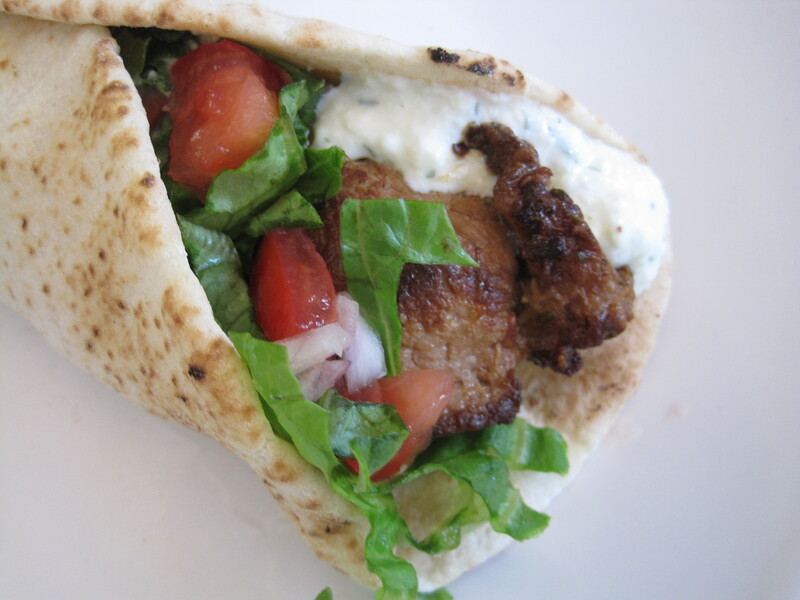 I’ve tried more authentic pork souvlaki recipes in the past, but this is our favourite. It’s easy to make and the meat can be marinated ahead of time for entertaining. It is best cooked on a charcoal BBQ, but any grill or cast iron pan will work. When it comes to tzatziki, I am extremely picky. Tzatziki (yogurt cucumber dip/sauce) varies in consistency depending on the brand or restaurant, but in my opinion, the thicker the better. My favourite store bought brand of tzatziki is Skotidakis and this can be found at some Costco locations. In a large ziploc bag, mix together the lemon juice, olive oil, soy sauce, oregano, and garlic. Taste the marinade and adjust the seasonings to taste. I prefer a lemony marinade. Then add the cubes of pork and mix well to ensure that all of the meat is well coated with the marinade. Refrigerate for at least 2 hours and up to overnight. Then skewer the meat onto wooden skewers. The pieces of meat should be just barely touching on the skewer. Preheat your grill to medium-high heat. Alternatively, you could cook this meat, unskewered, in a cast iron pan. Cook until just cooked through, turning a few times. If you have any excess marinade, you could use this to baste the souvlaki during the cooking process. Do not overcook or the meat will be dry and tough. Remove the meat from the skewers and serve immediately. 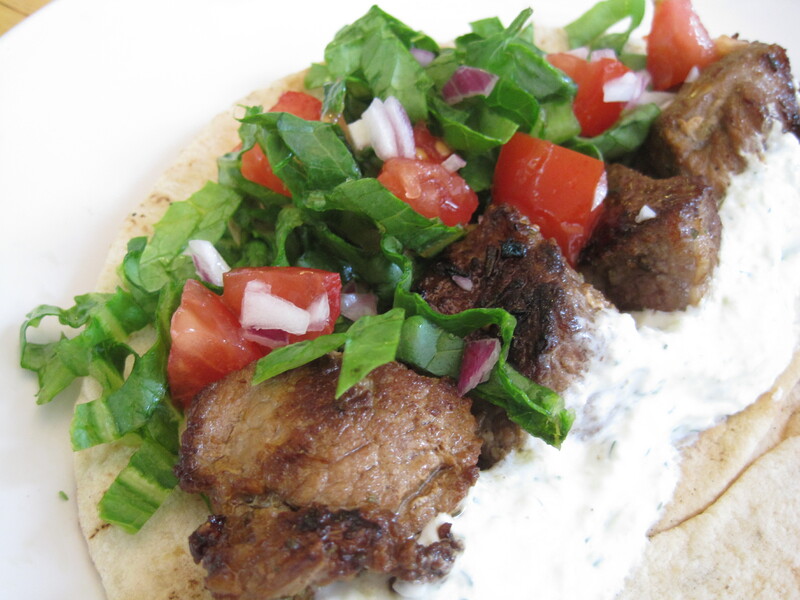 I recommend serving pork souvlaki on warm pita bread with tzatziki sauce, shredded lettuce, diced tomatoes, and diced red onion. I also recommend serving pork souvlaki with tzatziki sauce, rice, lemon roasted potatoes, and Greek salad. Place the shredded cucumber into a colander or sieve and sprinkle over a small pinch of salt. Mix gently and allow this to sit for 30 minutes. The purpose of this step is to remove some of the water from the cucumbers. Gently squeeze out any excess water. In a bowl, mix together the Greek yogurt, salted cucumber, smashed garlic, vinegar or lemon juice, dill, and chives. Adjust the ingredients to taste. In my opinion, a good tzatziki is thick, and rich and creamy with slightly sour, salty, and garlicky flavours. Allow it to rest in the refrigerator for several hours prior to serving as it will taste better over time. One of my addictions–I’ll have to try the soy sauce ploy, many thanks for the tip. Make my own yoghurt, let it sit for two days, then into cheesecloth for the quasi-cheese effect. I have been known to throw a little harissa in there on the rare occasion when I might possibly drink one (9) beer(s)…. This was probably one of the best souvlakis that I’ve ever had. Very delicious! Wow this looks incredible, cant wait to try it ! Thank you so much for your comment! I hope you like it!